Miss Hathaway being transferred. Will this change chances for a meaningfull Barker Ranch dig? National Park Service names Sarah Craighead as new Mammoth Cave superintendent. Mammoth Cave National Park has a new boss. Superintendent Sarah Craighead comes from Death Valley National Park, where the temperatures commonly exceed 120 degrees, to one that’s all about the world’s longest cave system, where the mercury is typically about 55 degrees. Many would see that as a step in the right direction. For Craighead, it’s a step back home. She was valedictorian of Caverna High School in nearby Cave City in 1974. The National Park Service, in a press release today, said that just as many college students do, Craighead took seasonal employment at Mammoth Cave National Park while attending Transylvania University in Lexington, Ky., where she earned a bachelor of arts degree in biology in 1978. 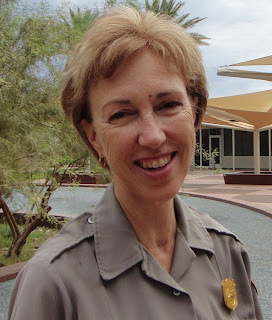 Prior to Death Valley, Craighead served as the superintendent of Saguaro National Park, just outside of Tucson, Ariz. She was the first superintendent of Washita Battlefield National Historic Site in Cheyenne, Okla., from 1997-2002. Unfortunately I doubt that much will change. Of course, I hope that I'm wrong. PS It still feels weird typing "I" instead of "Patty"
You should put a photo of Miss Hathaway, right next to Craghead! Hopefully Dostie will find the new superintendent, a bit more flexible. I thought the long national nightmare known as political correctness had run its course finally. You can imagine my embarrassment upon further review; that it wasn’t about her restricting exploration at Barker Ranch. Farf we had one of those Mammoth Cave threads once but I think we were talking about Mamma Cass! Yeah Farflung... we covered that topic previously, in regards to Cass. I remember the conversation well. "That's probably where Neil Young's missing motorcycle disappeared to!" The black hole... not even light escapes! Does anyone remember Jane Hathaway, played by Nancy Kulp, on the Beverly Hillbillies? The storyline was that she was the voice of reason to her chief, the greedy Mr. Drysdale. But she had a weakness for Jethro Bodine, who had a preference for Janet Crego, who was played by Sharon Tate. Patty says .... feels weird typing "I" instead of "Patty"
I think Patty must type Patty again...it was your own to Patty !!! Grtzz to All Family here ! !